For the first time, Jean’s Playhouse welcomes Trio Alexander, a flute, viola and harp ensemble! 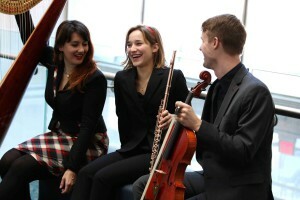 The musical trio met as graduate students at the Eastman School of Music. Trio Alexander has been featured by the new music collective OSSIA and the Cornell Contemporary Chamber Players and maintains an active role in commissioning, premiering and presenting new works. They have recently returned from their first UK tour having been supported by an Eastman Development Grant. Their repertoire includes the works of Claude Debussy, Kaija Saariaho, Jacques Ibert, Alan Rawsthorne, Leo Smit, D.J. Sparr, and many more. Flutist Caroline Sonett is an active chamber and orchestral musician in NYC. She has performed in world famous venues such as Carnegie Hall, Avery Fisher Hall, and the Kennedy Center. Caroline has been featured in recitals in both the United States and Canada. She was featured on the McGraw Hill Young Artist’s Showcase as the first prize winner of the Friday Woodmere Music Club’s Young Artist Competition. Violist Adam Paul Cordle is a distinguished soloist and chamber musician. He is a founding member of Trio Alexander. He has been featured in recitals in the United States, Canada, and Israel. Adam serves as principal violist of the Gettysburg Chamber Orchestra. He has been seen performing in venues such as Carnegie Hall’s Weill and Zankel Halls. Harpist Rosanna Moore is an avid chamber musician. She is also a founding member of Trio Alexander. She was the first harpist to be awarded the Stan Barker Memorial Prize for jazz improvisation. Originally hailing from the UK, Rosanna Moore is a candidate for the Doctor of Musical Arts degree at the Eastman School of Music. Individually the members of Trio Alexander are hardworking musicians but together they have perfect harmony. Trio Alexander will be at Jean’s Playhouse on Sunday, September 24th at 2:00 PM; tickets are $20 and on sale now through the Box Office at 603-745-2141 and online at www.jeansplayhouse.com.